No – the Stonefish did not kill me. I have been away for a week of land-based fishing at the town of 1770. I was fishing the rocky headlands, beaches and bays of the Deepwater National Park. 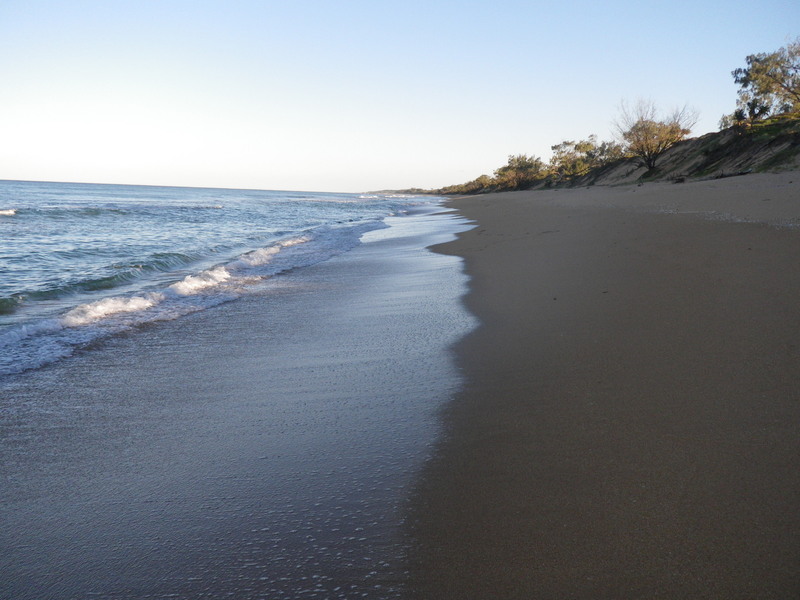 The park is reached via a sandy four wheel drive track that heads south from Agnes Waters. There are three main access points to the water, off this track – at Flat Rock, Middle Rock and Wreck Rock. I arrived last Tuesday and set up camp at the Wreck Rock camp ground. It is basic, but beautifully positioned in the Banksia covered sand dunes, behind the beach. It has a composting toilet and access to bore water and an outdoor, cold water shower. There are about eight secluded camp sites. I arrived at about noon and needed to catch dinner, so I set off for Flat Rock beach with my light spin rod. There was a light, cold, south westerly breeze blowing but the bright sunshine took the sting out of it. I started fishing at about 2.00pm. Flat Rock beach is so named because a long flat rock formation runs parallel with the shore, for about 4 kilometres. On the highest of high tides, it is covered by about three metres of water and on the lowest of lows, it is completely exposed. It is a great fishing platform to walk along, around low tide and it is also a great fish holding structure, on a high tide. The tide was only a little way into the run out phase, so the rock was completely covered by water when I walked out onto the beach. In these circumstances the rock forms the eastern wall of a huge gutter all the way along the beach. I rigged a 1/8th 1 hook jighead with a GULP 3” Minnow in the Pearl Watermelon colour and started walking north along the beach, stopping to cast every few metres. When I need to figure out what is biting and need to be sure of catching something to eat. I fish as light as I can, so I was using an 8lb Fluorocarbon leader. I soon got a couple of bites and grabs and quickly hooked a 25cm Whiting. I threw it back hoping for something better. I caught a few more that were around the same size. I swapped to the GULP 2” Shrimp in the Banana Prawn colour and after a few casts I found a patch of slightly bigger Whiting. It was now about 3.30 pm and I needed something for dinner so I kept four of the bigger Whiting, that where about 30cm long. When I reached a break in the rock, where the water was draining out to sea from the gutter, I switched back to the GULP 3” Pearl Watermelon Minnow. I got a couple of more aggressive hits and finally hooked a Dart that was edible size. I got a few more and kept the two largest. 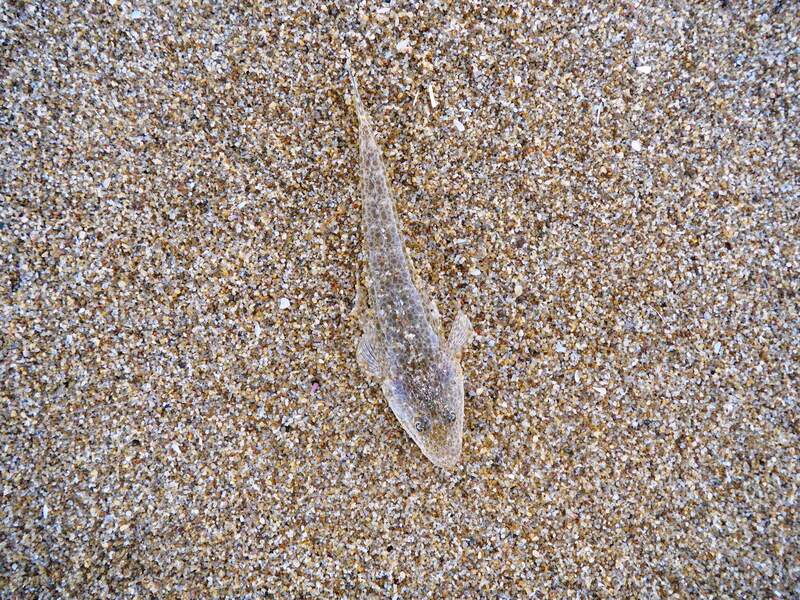 Then I caught a tiny, but very well camouflaged Bartailed Flathead, only about 20cm long. The sun was dropping and it was getting seriously cold so I headed back to camp to clean and then eat the fish. Nothing spectacular but I had a caught dinner. This entry was posted in 1770, Fishing Reports. Bookmark the permalink. 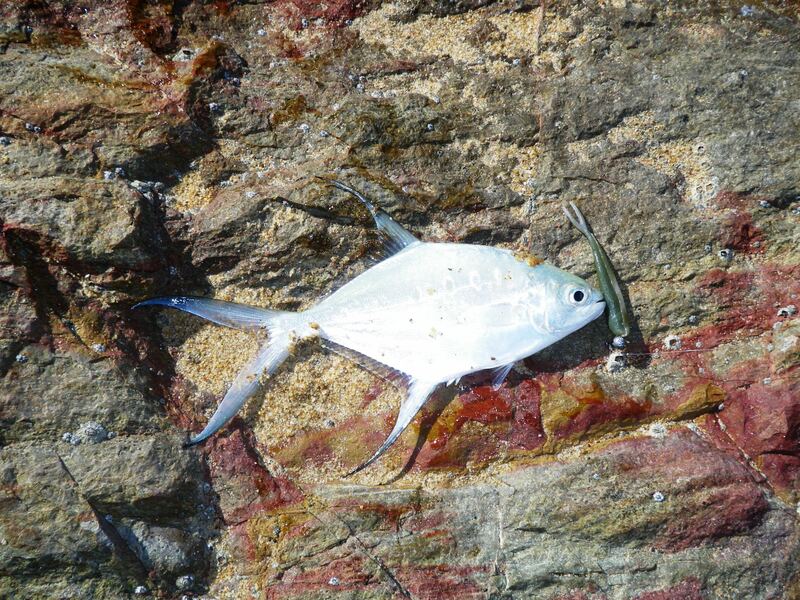 Glad to hear you have recovered from the stonefish!! However, I was starting to think it may be a good thing for pumice stone passage.